We’re currently updating our Film Club section. Please stay tuned! Everyone has their own preferences about what they like in a movie. Some people like gun fights, car chases and explosions, the more the better. Some people like battles between titanic monsters and superheroes. Some people like movies that make them laugh. Some people like movies that make them cry. Some people like movies that scare them. They are more than just pure entertainment, they make you think. The stories, the acting, the beautiful cinematography, and the music are exceptional. They take you back in history or forward into utopian or dystopian futures. They can be as realistic as documentaries or take you into incredible fantasies. They reveal cultures and social groups of which we knew little or nothing. They show us the beliefs of others and explain why they have those beliefs. They are as full as life is of unexpected surprises. They help us to understand our own lives by showing us the lives of other people. You want to watch them more than once and the more times you watch them, the more you learn from them and the more you appreciate them. The German film director, Wim Wenders, made a documentary homage to the great Japanese director, Yasujiro Ozu, called Tokyo Ga. Wenders says that Ozu discovered the true purpose of cinema, which is that film lets us enter the life of another person for an hour and a half or two hours. For that period of time we are taken out of our lives and we experience another person’s life. Wenders says that Ozu discovered this secret and that it was lost when Ozu died. I agree with Wender’s insight into Ozu’s gift, although I don’t think it was entirely lost when Ozu died. I think there are many directors who have made films that let us enter the lives and cultures of people who are very different from our own. Many of the films that I show you will probably have not seen before. Many of them have never been shown on American television. Some of them may not have been shown in the United States. But, no matter what year they were made nor where they were made, each in its own way is a great film. There are certain films that I call “perfect films.” By that I mean, a film which I cannot imagine any way to improve, it is so good that it is perfect. The next three films I’ll show are perfect films. 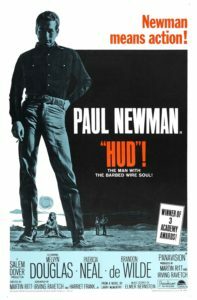 Hud is one example of a perfect film. From the gorgeous opening shot and the spare evocative music, you know that you are watching a great film. The acting, the dialog, the cinematography and editing, every aspect of the film is so perfectly done, it’s hard to imagine any way it could have been improved. 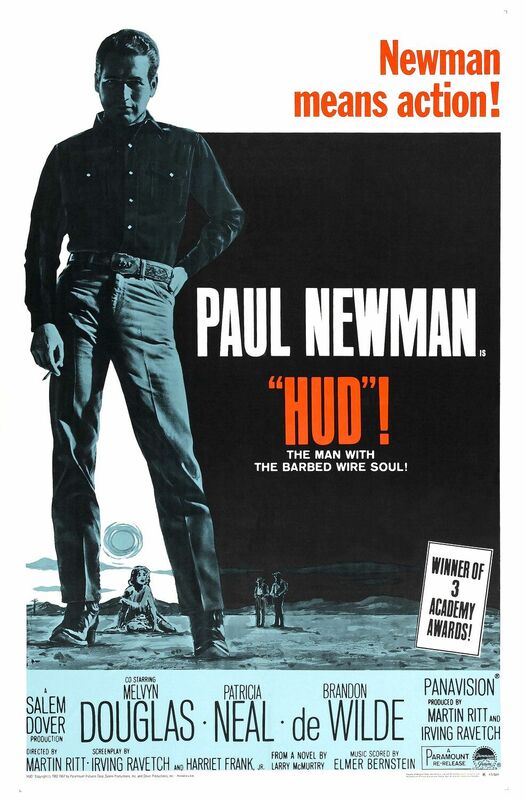 Hud is certainly one of Paul Newman’s best performances and may well be his best. Hud won three Academy awards and was nominated in four other categories as well. Persepolis is a magical film that begins with a spirited young girl growing up in the first years of the Iranian Revolution. Fearing for her safety, her parents send her to school in Europe where she comes of age in a very different culture and then returns to Iran. Nebraska is a loving homage to family life in the small towns on the Great Plains. By helping his father follow his dream, a son comes to learn things about his father that he never knew and his father comes close to his son. It’s a very funny and touching film.